After you set up your printer, you should be able to print a document easily — right? Read how the features in OS X Mavericks’ Page Setup sheet can help you solve most basic printing problems. Many programs have a Page Setup command on their File menu. Note that some programs use the name Page Setup, and others use Print Setup. (Print Setup is the quaint, old term, more popular in the System 6 era and in Windows than on today’s Macs.) Either way, this is the sheet where you can choose your target printer, paper size, page orientation, and scale. Become familiar with Page Setup. You might not need to use it right this second, but it’s a good friend to know. Even though some apps offer some of these Page Setup settings in their Print sheets, Page Setup is the only place you find these options in many programs. Users of network printers or PostScript printers might see slightly different versions of the Print and Page Setup sheets. The differences should be minor enough not to matter. Settings: When you have everything else in the Page Setup sheet configured just the way you want it for most documents, choose Save As Default to save this configuration as the default Page Setup for this application. Format For: In this pop-up menu, you find the name of the active printer. If you have several printers configured, you can choose any of them from this menu. This menu usually defaults to Any Printer, the least effective setting. Unless the printer you want to use appears here, you may not get the full functionality the printer offers. Paper Size: Use this pop-up menu to choose the type of paper currently in the paper tray of your printer or to choose the size of the paper that you want to feed manually. The dimensions of the paper that you can choose appear below its name. Page Setup sheet settings (including Paper Size) remain in effect until you change them. For example, when you print an envelope, don’t forget to change back to Letter before trying to print on letter-size paper again. Orientation: Choose among options here to tell your printer whether the page you want to print should be portrait-oriented (like a letter, longer than it is wide) or landscape-oriented (sideways, wider than it is long). 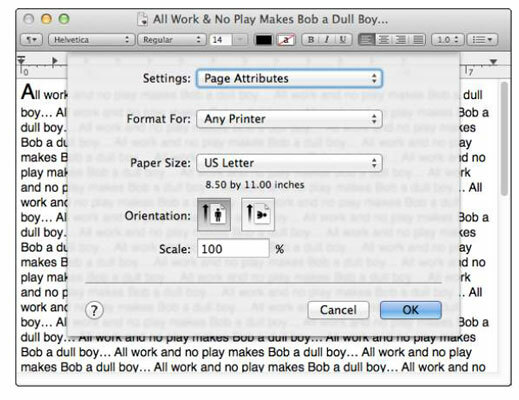 Scale: To print your page at a larger or smaller size, change this option to a larger or smaller percentage.